Category Archives: Restaurants: Around the I.E. 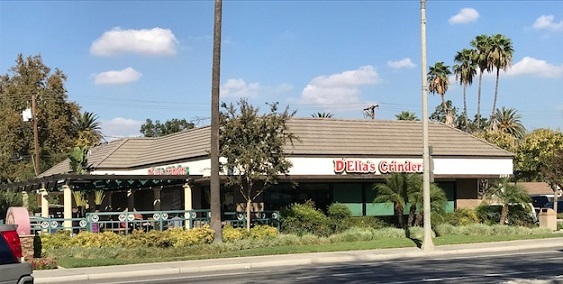 In Riverside a few weeks ago, I made a point of checking out an old recommendation from a reader or two, which was to eat at D’Elia’s, an old-time shop that specializes in grinders, otherwise known as submarine sandwiches. D’Elia’s was founded in 1955, a little before Ontario’s Grinder Haven, still in business but long out of the original owners’ hands. The D’Elia’s family owned it at one point, if I understand the history of each correctly. Today D’Elia’s is still in family hands, which seems to have made all the difference. Some scoff at Grinder Haven, saying no one knows what a grinder is anymore, but inside D’Elia’s on a Saturday afternoon it was wall to wall customers. The dining room is blandly 1980s, so there’s no charm in it. But there was an electric charge to be in a line at a nearly full restaurant. The menu is pretty much all sandwiches, except for a few salads. 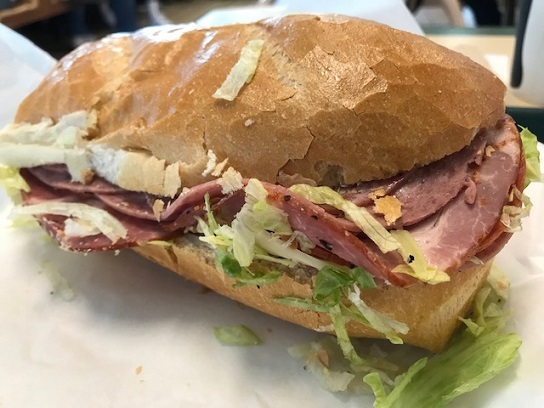 I ordered a half Sicilian grinder — capocolla, pepperoni, salami (both cotto and genoa) and provolone, with shredded lettuce — along with a bag of chips and a drink. The half sandwich was $9.63, compared to $11.07 for a full. In a way, that was a smart move, because the sandwich was all I could handle, and I don’t think leaving another half in my hot car all afternoon would have been the best idea. It was delicious, the meats peppery, the bread fresh and crusty. 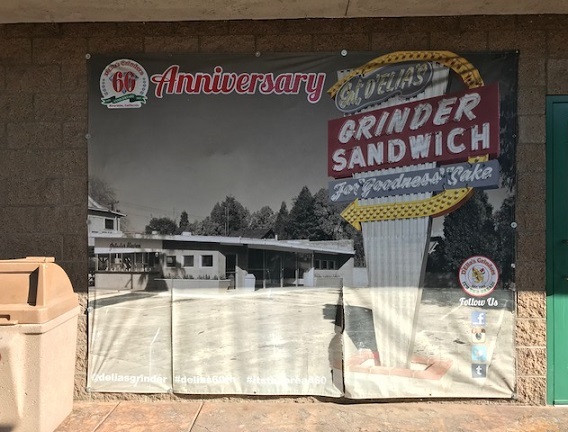 As the shop’s slogan goes: “It’s the bread.” It made such a difference that you can’t help but lament all over again that latter-day Grinder Haven owners have stopped baking their own rolls, deciding it wasn’t worth the effort. It is. The crowds at D’Elia’s are proof. Trivia note: According to a framed newspaper story on the wall about the restaurant’s history, the name is pronounced “Duh-EE-lee-uh’s.” I wish they still had the original sign, seen below in a vintage photo on a banner on the patio. 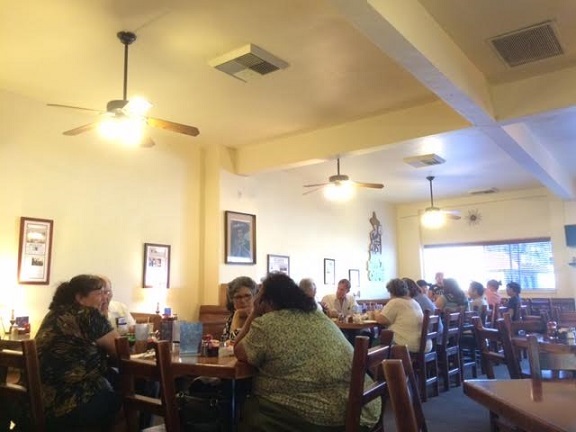 I’d never heard of the Mitla Cafe until Gustavo Arellano dined there with the New York Times in 2012 to talk about his book “Taco USA,” but it seemed very similar to the place to which I subsequently introduced Arellano, Ramon’s Cactus Patch in Ontario. 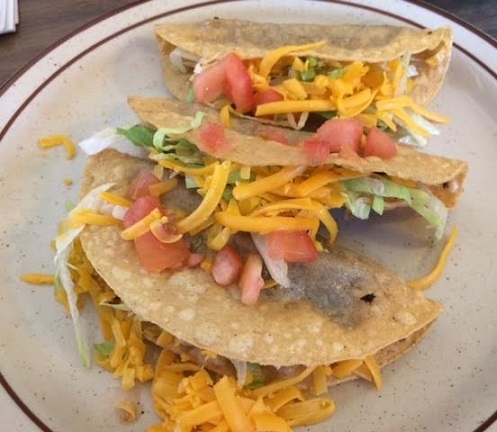 Both were family operations launched in 1937, serving Cal-Mex food, although Mitla has the distinction that its cooks taught Glen Bell how to make hardshell tacos, a skill he eventually parlayed into Taco Bell. Mitla also has the distinction of remaining in business; Ramon’s closed in 2013, shortly before its founder, Ramon Sanchez, died. 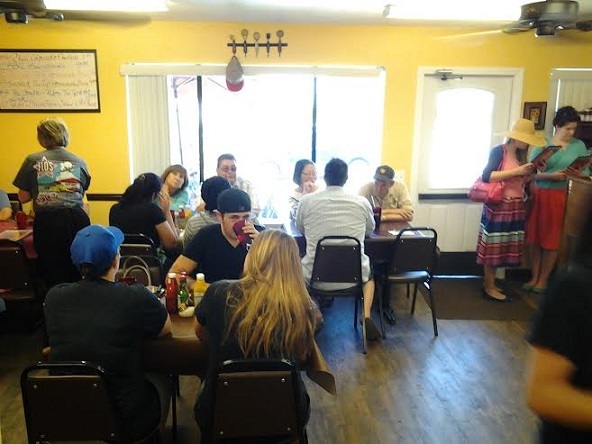 Descendants of founders Vicente and Lucia Montano still operate Mitla, which is now the oldest Mexican restaurant in the Inland Empire, and among the oldest in Southern California. Rarely do I head east, but in July I had to go to Redlands, and on my way back I eschewed eateries in that burg to go to Mitla. It’s pretty much equidistant from the 210 and 10 freeways, but only blocks from the 215, in the West Side barrio. Mitla occupies what appears to be its original building and once inside, past the glass bricks in the entry, you’ll take in the front room with its counter, swivel seats and vintage Mitla calendars, and feel like you’ve stepped back in time. 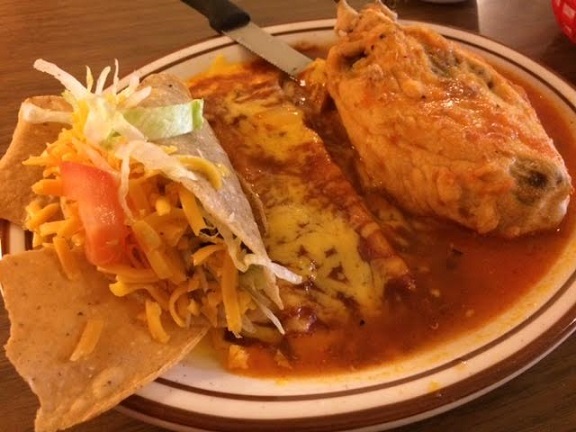 The enchilada and chile relleno were covered in a meat sauce that was reminiscent of Ramon’s, a good sign. Those two items were good, but for me the taco was the standout, and I wished I had more. It was very similar to Ramon’s: fried with a ground beef patty, plus shreds of lettuce, diced tomatoes and yellow cheese. On Tuesday I had to be in San Bernardino for work reasons and took that as an opportunity to go back to Mitla — and order more tacos. This time I sat at the counter and got the three-taco combination, ground rather than shredded beef ($7.25), and got to marvel at them anew. To be clear, there is nothing cutting edge about this food, and the menu even has a section I believe was called “American Tastes,” with hamburgers and hot dogs. 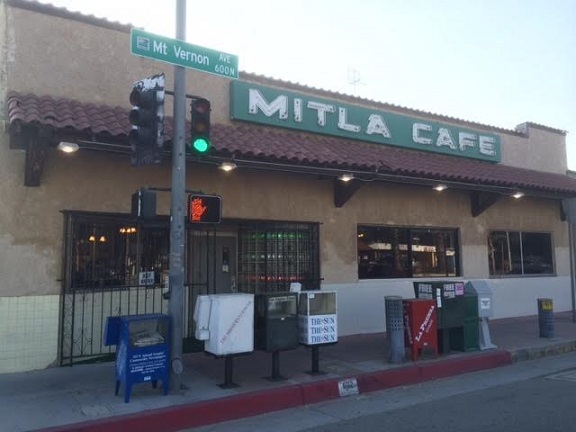 Mitla is almost a classic coffee shop, only a Mexican-American version, where you can get fries with your huevos rancheros. My point is, you could have superior tacos and burritos at many other places, possibly even at the two Mexican restaurants on other corners of the same intersection. 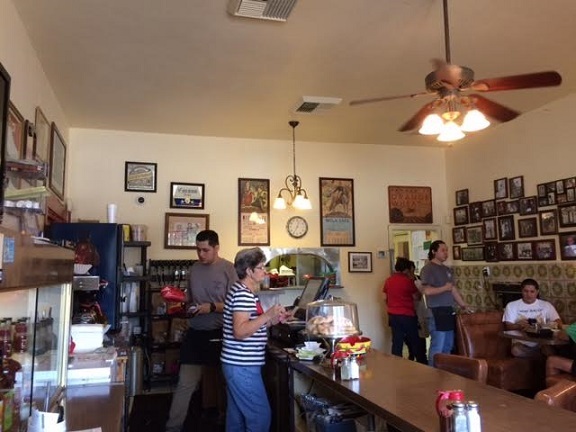 But as an admirer of Ramon’s and all it stood for, Mitla Cafe fills that void for me, and might for you as well: food, ambience, family, tradition, history. 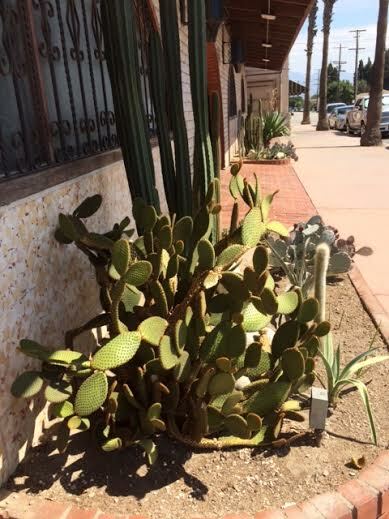 Heck, there are even two cactus gardens outside. Thus far I’ve stuck solely to Inland Valley restaurants here, roughly Glendora to Fontana, Diamond Bar to Norco. 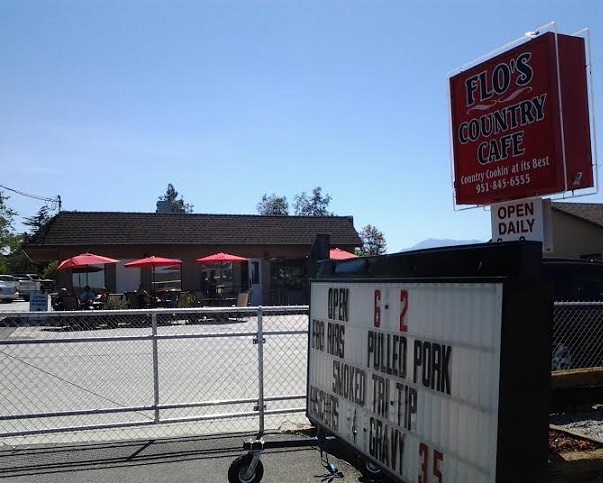 But when a friend suggested we try the new Flo’s spinoff in the wilds of Riverside County, and offered to drive, I was game, and I figured I might as well share the results here. After all, the other two Flo’s are Chino favorites and some of you may be curious. I’ve added a “Restaurants: Around the I.E.” category just for this, and for any other excursions I may make in the future. Cherry Valley? I’d never heard of the place. Getting there requires a long but pleasant drive out on the 10 well past Redlands (or on the 60 past Moreno Valley if you prefer) to the Beaumont area. Flo’s took over a small cafe there earlier this year. Unlike the Chino locations at the airport and on Riverside Drive, this really is country. 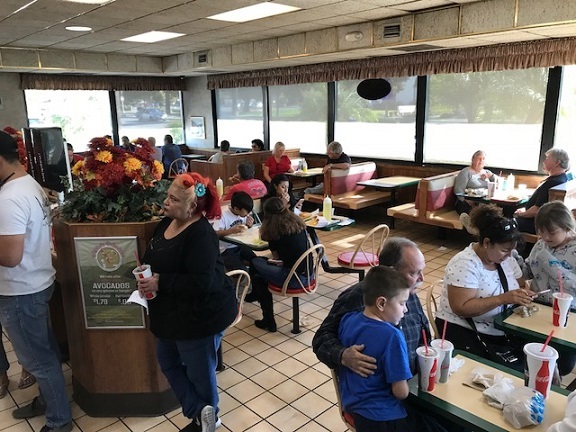 This Flo’s was an immediate hit, and the restaurant could probably be twice the size based on the crowds we witnessed late morning on a Saturday. The small parking lot was full and we parked on the gravel lot beyond. There was a waiting list to sit inside, which is cozy, but we got a table outside right away. The menu is basically the same as the other Flo’s: breakfast and lunch staples like biscuits and gravy and burgers. But this Flo’s also has barbecue. Having heard from Bulletin reviewer David Cohen that Flo’s had the best BBQ in the Inland Empire, we opted for that, each getting the No. 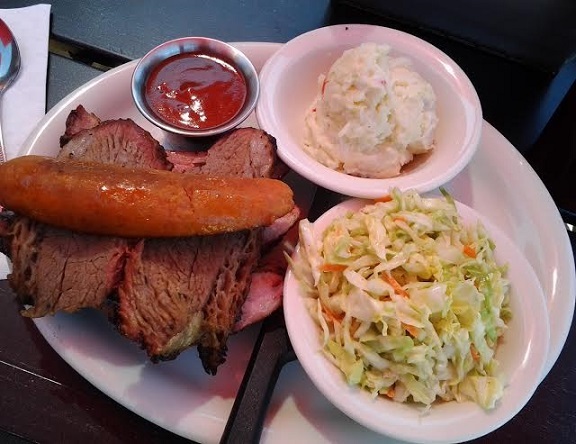 4 combo: three baby back ribs, tri-tip and a hot link, plus two sides ($11). Well, it was good barbecue, in Texas style, although our socks remained firmly in place. Personally I like ribs finished off on the grill, not pink when they’ve only been smoked. The tri-tip and hot links were more to our liking. The price was right, too, and our sides — Texas toast, slaw, beans — were tasty. The sauce was more North Carolina than Texas, according to my barbecue-fancying friend. Flo’s, of course, is known for its pies, and they had a good assortment. 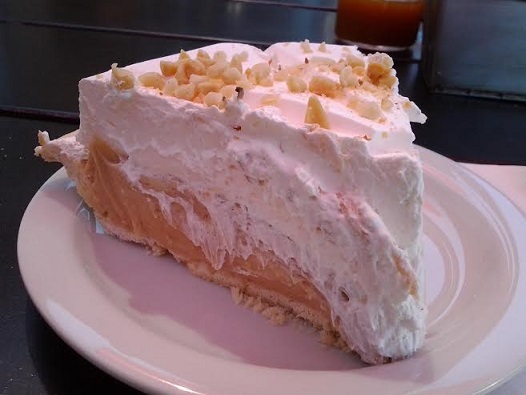 I got a slice of peanut butter cream ($3.50) and was not disappointed. 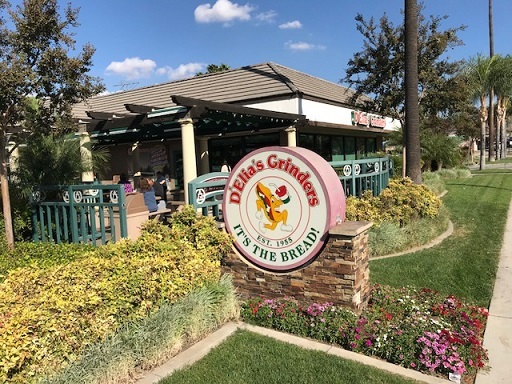 Also, it was nice to see waitress Debbie Mahlstadt, a familiar face from the Chino Airport Flo’s, who’s now in Cherry Valley much of the time. So, the third Flo’s was a good, if possibly once-in-a-lifetime, experience, based on the geography, and now I can brag that I have been to all three existing Flo’s. Do you want to listen?